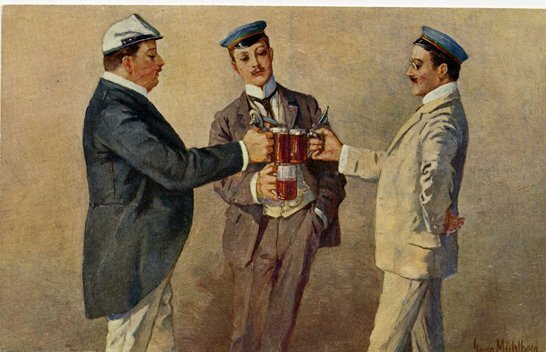 The history of the German beer contests or beer duels among student societies or Studentenverbindung is complex and recondite. While offering no model of emulation today – au contraire – they have interest for the student of beer’s past. Despite the foreignness of the subject matter the U.S. press introduced the topic in colourful stories in the last decade of the 1800s. I’ll review a couple of these, but first a prelude. The beer duel is connected to the other tradition of the student societies, duelling by sword, evolved today as “academic” fencing, accomplished from a fixed position with no winner declared. The beer duel, or bieryunge, was a contest spurred by a slight or insult. The offended party would demand a duel of the mugs, or it might be ordered by a superior in the club to settle a dispute between junior members. If there was anything to be said for it, the drink gotten down was generally minimal – just one beer unless some point of procedure was not followed, in which case more might be required. So not the perilous form of dozens of glasses although some students engaged in that too, as detailed below. In the bieryunge two men drank down a mug as fast as they could. He who finished first sang out in triumph bieryunge! A referee decided the result. The implication of the exclamation was the loser was a “beer youth” – a tyro at the malt. Sometimes another word was mandated for the victory shout, often a nonsensical term. A participant who spilled too much would be ruled the loser for “bleeding”. One sees here an implied analogy to sword duelling. Indeed it seems the beer contests grew popular as an alternative to that more dangerous practice. Youtube has a number of clips called bierjunge which gives some idea of it, at least the speed and nonchalance, see e.g., here. The bierjunge formed part of a complex ritual or code of beer drinking adopted by most student societies. Each group had a particular orientation: sporting, drinking as such, study-philosophical, religious, artistic, etc. The group of societies known as The Corps was always the most aristocratic and socially elite. Even in this constellation the groups differed, usually by rank in the social hierarchy. Despite their great number the student societies always represented a minority of students. The majority could not afford the dues and other costs to participate. Incidentally the societies continue to this day but the competitive sword play, and we assume the glass duels and complex beer codes, are of the past. “The weapons are good and equal. Silentium. The beer duel begins.” …. 19th century articles by English or American travellers describe the clubs and their customs. These are easy to find for anyone interested. Within the confines of this essay, this second news report, in 1892 in Philadelphia, gives a fuller sense of it. The story points out that the standard bieryunge was usually, but not always, benign, and students engaged in other competitive beer drinking, too. In the latter, some of the quantities consumed rivalled or even exceeded what the two brewers did in Union Hill, NJ (see my previous post) – hard to believe but apparently true. Unusually in such accounts, the brand of beer for one of the contests is mentioned: Schiefferdecker. The founder was a Bavarian who had relocated to northern Germany, near Konigsberg, now Kalingrad. There he built one of the largest breweries in the north. This suggests to me the local market was inclining away from North German top-fermented specialties in favour of Bavarian-style and other lagers, a trend that finally dominated brewing world-wide. See this German account of the brewery, and this one in English. It seems the clubs mostly sang songs. Perhaps at this remove one gets a distorted view of their character, as university couldn’t have been one long carouse. After all Germany was far from unsophisticated in the arts and sciences… The mug must have been left behind so students could graduate and follow their chosen calling. The last-mentioned account hints at this when it refers to senior students who had left their club and were writing exams. Many reading will think of fraternity life in North America. I’m not that knowledgeable on frats so can’t offer even the beginnings of a comparison, but suspect there were more differences than similarities. Note re image: The image above is from a painting by Georg Mühlberg and is believed in the public domain. It was sourced from this Wikipedia entry on the Bierjunge. All intellectual property in the image belongs solely to the lawful owner, as applicable. Image used for educational and historical purposes. All feedback welcomed.